The undefeated Green Bay Packers (11-0) take on the New York Giants (6-5) in Metlife Stadium this Sunday. 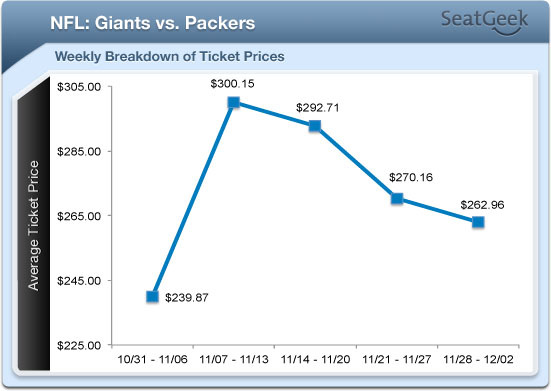 On the season, tickets have been selling at an average $267.42. However, with a couple of unfortunate losses the past two weeks against the Saints and Eagles, local fans don’t seem to be too eager to spend to see the Giants. Prices peaked in the week of November 11th with an average price of $300.15, but have declined, most sharply after the Eagles loss. However fans can watch the Giants play spoiler on Sunday at an average of $262.96, which is 12.39% cheaper than the peak price in November. Current listings for the game against the Packers show the cheapest ticket is a General Admission ticket in GA 11 selling at $38. The most expensive ticket is a single ticket in the Presidents Circle section at $25,891. While this upcoming game is above the average price for a Giants home game this season ($218.49) at MetLife Stadium, the remaining home games against the Washington Redskins and Dallas Cowboys are well within reason. The Giants are far from out of playoff contention. While currently the second team on the bubble looking at a Wild Card Playoff spot, they are only one games behind the Dallas Cowboys for first place in the NFC East and still have two games against their conference nemesis. Those two games will play an integral role in who makes it to the playoffs. Snag a game for the New York Giants and save with SeatGeek. Let us know how it goes by hitting us up on Twitter @SeatGeek.